OLATHE, Kan.--(BUSINESS WIRE)--Garmin International, Inc., a unit of Garmin Ltd. (NASDAQ:GRMN), today announced BlueChart g3 and LakeVü g3, a new line of cartography products for coastal and inland boating that blend the best of both Garmin and Navionics content together for the first time to deliver unparalleled coverage and detail. The new BlueChart g3 charts and LakeVü g3 maps will also be the first preloaded cartography to offer built-in Auto Guidance1, a technology that instantly searches through relevant charts to create a suggested route based upon the user’s desired depth and overhead clearance. The new Garmin g3 cartography updates are being announced at the 2018 Fort Lauderdale International Boat Show, and will be on display at the Garmin booth #332 in the electronics tent. This new Garmin cartography brings unrivaled detail and convenience to users with navigational aids, spot soundings, depth contours, tides and currents, and detailed harbors and marinas. It offers seamless chart presentation with up to 1-foot fishing contours that provide a more accurate depiction of bottom structure for improved fishing charts and enhanced detail in swamps, canals, marinas and port plans. What’s more, Garmin was the first to introduce Auto Guidance, and now this simple marine auto-navigation technology is included with all Garmin g3 accessory cards, and it’s even built-in to many Garmin chartplotters—all at no additional cost to the consumer. For even more detail, BlueChart g3 Vision and LakeVü g3 Ultra accessory cards are also available. BlueChart g3 Vision includes everything available with BlueChart g3, plus high-resolution satellite imagery that provides the user with a realistic view of their surroundings. Unique 3-D views, including MarinerEye and FishEye, provide additional perspective both above and below the water line, and crystal-clear aerial photography shows exceptional detail of many ports, harbors and marinas, which is especially useful when entering unfamiliar ports. For inland customers, LakeVü g3 Ultra includes maps of more than 17,000 lakes with up to 1-foot contours. Of those, over 150 are Garmin Elite surveyed lakes with high-resolution satellite imagery, multi-beam sonar views shore-to-shore, side scan photos and photos of notable spots above the water too. LakeVü g3 Ultra also includes high-resolution relief shading that adds visual depth to the 2-D map, making it easier to interpret contours, Dynamic Lake Level and more. The new GPSMAP® 8600/8600xsv series, expected to be available in Q1 2019, is the first to come preloaded with Garmin’s exclusive BlueChart g3 coastal charts and LakeVü g3 inland maps with integrated Navionics data and Auto Guidance technology. The new BlueChart g3 and LakeVü g3 downloads and BlueChart g3 Vision and LakeVü g3 Ultra accessory cards will be available in February 2019. To learn more about the new BlueChart g3 and LakeVü g3 product lines, visit garmin.com/maps. 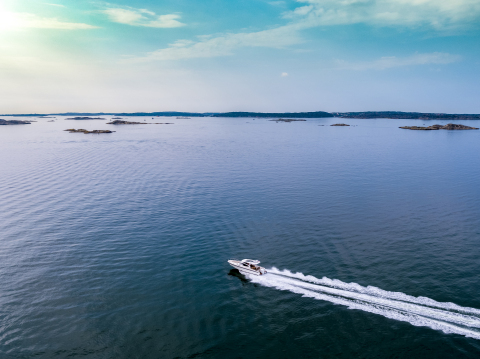 Garmin is the world’s leading marine electronics manufacturer2 and was recently named Manufacturer of the Year for the fourth consecutive year by the NMEA, an honor given to the most recognized marine electronics company for support of products in the field. Garmin’s portfolio includes some of the industry’s most sophisticated chartplotters and touchscreen multifunction displays, sonar technology, high-definition radar, autopilots, high-resolution mapping, sailing instrumentation, audio, entertainment and other products and services that are known for innovation, reliability, and ease-of-use. Other Garmin marine brands include FUSION Entertainment, Navionics, a premier supplier of electronic navigation charts, and EmpirBus. For decades, Garmin has pioneered new GPS navigation and wireless devices and applications that are designed for people who live an active lifestyle. Garmin serves five primary markets, including automotive, aviation, fitness, marine, and outdoor recreation. For more information, visit Garmin's virtual pressroom at garmin.com/newsroom, contact the Media Relations department at 913-397-8200, or follow us at facebook.com/garmin, twitter.com/garmin, instagram.com/garmin or youtube.com/garmin. Garmin International Inc. is a subsidiary of Garmin Ltd. (Nasdaq: GRMN). Garmin Ltd. is incorporated in Switzerland, and its principal subsidiaries are located in the United States, Taiwan and the United Kingdom. Garmin, BlueChart and GPSMAP are registered trademarks of Garmin Ltd. or its subsidiaries.